Richard Hind Senior Boys School. c1978. Photograph courtesy of Gordon Mann. It was 3 years before comprehensives. Mr John Morley headmaster. Hi to all my Raggy Behind classmates and friends. I am planning a reunion Saturday 7th May 2016 in Stockton. Venue to be advised. Contact me on gtthomspon@gmail.com (notice this spelling) if you want to come – please put the word out. Big Norm here, would you like your CSE certificates? Would site managers please share my email address with Nigel Roots. Sorry I just noticed your reply, I would love to finally see proof of my academic achievements haha, I guess 46 years is long enough for you to look after them. Anthony Spacey here, I would like to go to the reunion just let me know the venue and I will be there. I am not having much luck in tracking down some of our mates from school but will keep trying. If Nigel or anyone else can put me in touch with them please let me know. Any photos of the football teams please? I attended ’71-76, fellow players may include, G.NEAL. P.McMURDO. K. SMITH. S. FAWDON. L. BIBOK. P.RABY. Yes I remember Peter Finlay same class as me. A good school and a good basis for the future. Mr Thomson and Mr Carlin gave me a love for literature and Mr Gibson history. Went in the Merchant Navy and called in to see Mr Kear (geography to tell him what I had seen) I live at Whitby now after 29 years in HM Coastguard. Quite correct. Also between 4 & 5 and then 6 & 7. Occasionally as a teacher it became necessary to teach from the corner where the communicating door was. If a teacher had to leave the room and class unsupervised or just on occasion if a teacher was having problems with a particular form group. For sure the class in the adjoining room was aware of a beady eye! Jacqueline Furphy, you were in my class at Richard Hind, we started in September 1957. I have a class photo from either the 1st or 2nd year, will try and find it and post it on the site. The fact I can remember most of the names of the class is amazing after all these years! You lived in Harlsey Crescent, had a brother called Brian and a younger sister. I came to your house for tea several times I remember. It was the detached house next to the path through to Darlington Road. I still keep in touch with several school friends, we did have a reunion several years ago – Kathleen Hunter, Angela Thomas, June Tweddell, Jennifer Myers, Vivienne Calvert, Elizabeth Inman, were a few from our class who were there. I seem to remember there was a partition that could slide open to make one big room between classrooms 2 and 3 – am I right? Are you the Jane Chapman that lived on what we then called Little Roseworth? I attended from 1966. I remember the girls and boys school becoming mixed and finally being allowed to enter through the front doors. I also remember walking down to the old dinner halls. I remember doing this one day after a large hail storm and the school and roads were all flooded. Amazing the memories that have come flooding back. I would like to catch up with any old school mates and see what you are all up to. I attended Richard Hind from 1967-1973, In 1973 we won football league. Like to hear from anyone in that team. There is a class reunion on Monday 22nd September at the Stockton Arms Hartburn, year 1948-1953. FOUND THIS SITE WHILE BROWSING.I ATTENDED THE SCHOOL BETWEEN 1958 AND 1963 AND HAVE BOTH GOOD AND BAD MEMORIES.THE GOOD ARE ALL SPORT RELATED AS I OPENED THE BOWLING FOR THE SCHOOL IN ALL YEARS AND ALSO DID THE SAME FOR GRANGEFIELD GRAMMAR SCHOOL,STOCKTON CC,UNIVERSITY AND LATER SOME TOP KENT AND SURREY SIDES.I REMEMBER SOME OF THE TEACHERS BEING VERY SUPPORTIVE AND HELPFUL AND MATHS AND HISTORY BEING PARTICULARLY GOOD.THE BAD MEMORIES WERE OF THE BULLYING OF MANY PUPILS BY OTHERS.IT CERTAINLY TOUGHENED ME UP AND I CAN SAY THAT NO ONE HAS EVER DONE THAT SINCE!I HOPE THE OTHERS THAT SUFFERED HAVE ALSO DONE WELL.I LEARNT SOME VERY USEFUL LESSONS ABOUT PEOPLE AND LIFE WHICH IS PROBABLY THE PURPOSE OF SCHOOL AFTER ALL. I attended RHS Girls School, went after the 11 plus cannot remember the year. I can remember Miss Rowbotham, going to Lustrum Hall for Domestic Science and Sewing lessons. I left in 3rd Year as we moved to Gt Broughton, but I think back to the lovely times I had at this school, really enjoyed the morning assembly and my love of Hymn singing began there. I was in the speech choir, remembering class mates and friends names I am at a loss but I do remember a Hermione Thomas, only because she went home at around 2pm on a Friday. I lived in Hartburn at the time would be interesting if anyone remembers me. My years at Richard Hind school (1956 – 1961) were not the happiest, but I now realise that much of what I did there was useful, but not meant for me. I am in touch with Jeff Beall, who writes from the London/Surrey area when he finds the time. My friends were George Barber, who lived near the school, Alex Freeman and Ian Mead (both now deceased, I believe. Another was Barry Duckett. Some of us went on to Grangefield Grammar school and the sixth form, and then to University. From memory, the classrooms were as follows: English (Mr “Pop” Carling and a real terror called Mr Caigill); Maths with a selection of rather inept teachers, although Mr Woodward was good (he also loved cricket, and drove me on his motorbike and sidecar to Middlesbrough to watch Yorkshire; Religious Education; History with Mr Gibson, who lived near my family (his son Geoff was a good friend); Art with Mr Buckle; French with the delicious Miss Hall and Geography with Mr George Kear. Others have recounted their stories of the woodwork classes, the chemistry class and the sports in St Peter”s Hall. There were indeed no showers, and it was even worse where we were taken in winter months to play football in Fairfield! Happy days, for some. I left Stockton when I went to Leeds University, and only returned once in the 1970s and then again a couple of years ago. What a poor old town Stockton has become, run down, vandalised and astonishingly dirty. If others have any memories, then I would love to read them. Dr F Starr, I think you have missed out the RK room with Knocker Taylor. When I attended from 1957 the rooms were 7 Geography George Keir 6 English/French with Bubbles Thompson or a visiting French Mademoiselle 5 Art Sid Buckle or Len Bone 4 History with Smiler Gibson 3 Religeous Knowledge with Knocker and sometimes maths with Johnny Rosser 2 Maths with Snudge ? 1 Eng Lit with Pop Carling or after 4pm DETENTION! Hi Alan, Edmund Todd here – you may remember we were always vying for top place in metalwork. Gee you got a good memory re names of teachers. You missed out Norman Bird – Physics and PE. I liked Gibson, he used to say ‘Bless my cotton socks’. I started Richard Hind School several months late because mother sent me to Deighton to live (The beginning of the war) and I attended Brompton School and Northallerton Grammar half and half, the place was full of evacuees. Stockton Grammar when I returned home said I could only start the next years first term mother was not standing for that so RHS it was. They had just started a new experiment where certain boys went in to (Technical) classes. I was one of them. The classes were small, never more than 18 boys which meant we got some very good tuition. Nearly all those lads did very well in local engineering works. Some of the names of Teachers mentioned are unfamiliar. We had a french Teacher very tall called Miss Du——- something or other. Miss English was the English Teacher, Mrs Rowbotham came and went as she also taught classes in the girls school. I seem to remember she was into Esperanto and tried to get us interested. I do remember a Dawlish or Dawson. I went back once with my wife, the old school had gone and we recognised practically nothing. The photograph shows the the main corridor running along the east side of the school. Starting from the near end, it was the room given over to Geography, French, Art, History(Smiler Gibson), and Maths, right at the end, where the main cloakroom was. Adjoining onto the corridor, running east-west was the English Class (Pop Carlin). Next to the English Class was the Main Hall, which was shared on alternate days, with the Girls School.The Headmaster”s office was on the other side of the corridor to the Main hall. I had many visits to “see” Mr Rosser, the Headmaster, my hands always coming away warmer than when I went in. But when he gave out punishment he was always fair. I was there from 1954-59. He came to see me as one of his better pupils and this led to a very interesting conversation just outside of Smiths Bookshop in Stockton High Street around 1965. But first some background. Rosser had a difficult range of pupils to deal with, all of whom had partially failed the 11 plus. Accordingly, the school only taught up to “O” level, not “A” level as would be the case in a Grammar. The only language taught was French. The aim of the school was to teach the basics of administrative and technical jobs, so that the pupils could expect to get a reasonable white collar, or brown overcoat job, when they left school. For example, those who had a liking for subjects such as chemistry would have got a job as a lab assistant, those who liked art, sufficient knowledge to become commercial artists, and those who liked English, enough technique to have become a reporter. But this meant that Rosser had difficulty getting teachers of the right type. They had to be knowledgeable and dedicated enough to teach their subjects to quite a high level. But unfortunately because the school was not a Grammar it did not have the status and pay associated with a Grammar. But as far as I could tell there was not much dead wood in the teaching staff. Whether these problems led to the decision to disband the school, I do not know. But, as I mentioned, I ran into Mr Rosser in WH Smiths in the mid-sixties. He was very upset about the closure. There was nothing I could do except listen sympthetically. But I do think the removal of this type of school, which provided really good training in technical subjects, was a wrong move by the powers that be. Unfortunately its too late to put the clock back. Hi to all the lads and lasses that attended the Raggy Behind during the years 1963-1969. Just found the site by mistake but having a good laugh reading some of the tales. Its a long time since I have seen George Thompson and Brian Maddigan but now and then I hear a tale or two. George and Brian were some of my best friends there as well as Clive Smith(not heard from him for many a year)would like to know what he is up to now. Any of the lads reading this try to get in touch if you can, I am still in Stockton. I know we had different circles of friends at school, but I remember you as a full back with the same style as Stuart ‘Psycho’ Pearce. I’m in touch with George Thompson on facebook, he lives in Australia now. Most of my family still live around the Stockton area, but I moved to Hartlepool almost as soon as I left school. Hope you’re well. Oh fond memories, Margaret Lonsdale teaching me to tap dance whilst playing Netball (goal defence), Mrs Cowie stubbing out her cigs on the wal1 outside the classrooms, going to see the England Hockey matches at Wembly and being so far back, the players looked like ants, going to Lustrum Hall for probably the worst dinners in the world and last but not least going to the old swimming baths at Stockton (still remember being frozen going in and coming out). Richard Hind was a great school,I enjoyed my time there even though I was always late for school.I lived in Eamont rd. in Norton and I was always missing the school bus,which we caught at the Red Lion so I used to jump on the 0 bus and get off at Parliament street and run all the way through the streets to school and John Smith, my form master used to bend me over the desk and give me a bang on the bum with a book to the great amusement to the rest of the class.My friends at school were Harry Turbin,Arthur Dodds,Bill Longmuir,Ronnie Buffham. I don”t know if any are still living, if they are they”ll all be in their 80s now. Mr Plummer was called Eggy because his initials were E.G.G. Plummer. He once made me run around the infants playground spinning a set square on a pencil, during the infants playtime! I”d been caught doing it during his lesson. I wasn”t the first or the last, no doubt, to suffer such a punishment. At least it was slightly better than “six of the best”! Sorry I made a mistake I went in the army in 1947 and not 48. There was one Teacher ar Richard Hind who had an influence on me, it was Mr Plummer, we called him eggy for some unknown reason. He had a class room at St Peters Hall and taught Technical Drawing and Geometry. He would often let fly with a board rubber and when one hit me on the shoulder I fired it back which got me yet another visit to the Head masters office. From that day though he did take an interest and gave me a love for working out how to put technical things on paper plus a love for maths in all its forms, it all came in handy in later years. One other thing about St Peters Hall, we had our school dinners in there, at least the boys did. The teachers sat at a top table and we sat down the sides, they watched us eagle eyed to make sure we used the knife fork and spoon in the correctly proscribed manner. There was a potato shortage in those early years of the war and we got boiled rice a couple of days a week. It was a grey gluey mass that made me feel sick to look at it and really sick when forced to eat it. One teacher accused me of trying to lose the war all on my own by not eating the food Sailors were risking their lives to bring to us. The mess would end up in my pocket and make a mess of of coat so more trouble from mother. I have hated boiled rice to this day and will not eat it. Sorry lads, I started the Richard Hind Senior School when Mr Webster was still Headmaster. That was in 1940, he retired shortly after and we had Mr Rawlins (Rawlinson)? then Mr Rosser. Sandy Dobin was Art and told me that as an artist I would always get a job, whitewashing toilets, they still did that then. He had pictures of the WW1 trenches and war scenes round the walls of the class room. Miss English took English, Miss Dufney? us young lads spent out time weaving dreams around her as young lads will. Mr Dawson was he Woodwork? I remember Sid Williams well the PT master, he was the Egyptian swimming champion? we never found out how. He taught us all the fighting skills including Cutlass and Epee. We did some of the sport on St Peter”s Hall and the rest in Ropner Park. Apart from my weekly visit to the Headmasters Office for six of the best I enjoyed every minute of it. 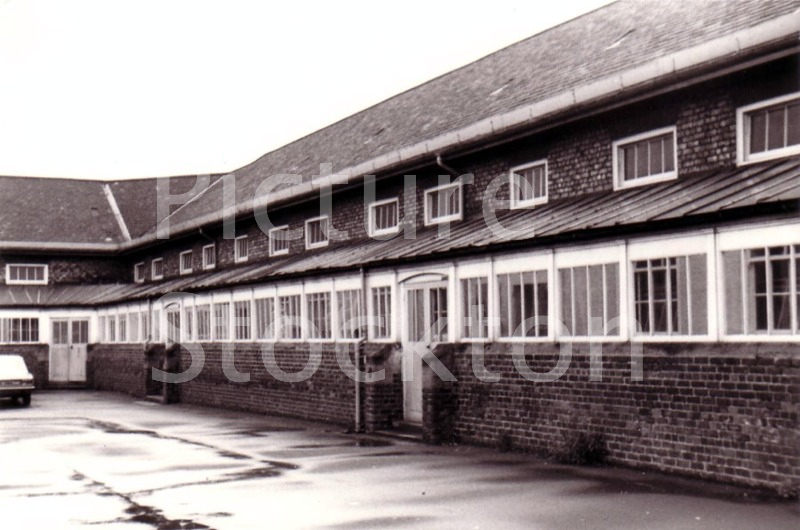 I left in the November 1944 to go and work in Browns Sheet iron shop Prince Regent Street and then the Army in 1948. My wife attended the girls school, though we both lived in Norton I did not meet her until years later, that big wall had a lot to answer for though we did get through to the shelters if the warning sounded. The result was Teachers from both schools with chairs and whips trying to tame us and drive us back. Happy days. Don looking at your start date at Richard Hind it must make you one of the oldest if not the oldest ex Richard Hind pupil on the site.I only remember Sandy, Mr Goodyear and Charlie Charlton.I started in 1943 in the middle of the war a full six years after you. My cousin Arthur was a pupil round about you era and I used to go and watch him play football for school in my short trousers.The first letter from Gordon Mann lists the staff when I was at RH in the same year as Gordon.Keep healthy Don. I attended Richard Hind from 1937 to 1940, the teachers I remember were Wilmot Webster,head master,John Smith,my form master,Slasher Pears,maths,Sandy Dobin art and woodwork,Mr Goodyear,maths,Mr Crozier, french,Charlie Charlton,chemistry,Mrs Rowbotham, french,Mr Dodds,english and a couple more I cant remember. Hey Swag, Nigel Roots here, I just stumbled on this site and cannot believe the names I am seeing, they bring back a lot of memories, hope all is well? I have been living in Vancouver since 74. Not sure if this will make it to you but had to try. Hi Nige, Norman Hill here, I’ve still got your CSE certificates from 1970!!!! If you want them let the site know & I’ll send them to you. Hope you & Sue are both well. Swag do you get to Pools matches! I’m season ticket holder….I stand in the Mill House. Col Mitchell is trying to organise a RH get together for Sept 2015, 50 years since we started at RH. Hey Norm, good to see your name, brings back lots of memories all good, still supporting the Pool I see well someone has to LOL “go Boro”? All is well here and I will make sure I track you down next time back in UK to grab my 10 certificates! Hope you and Liz are doing well. Did the reunion get sorted out? Trying for another reunion in Stockton on Saturday 7th May 2016 (sorry I missed the last one) Venue to be arranged. Not sure if you will be able to make it Nigel – It’s a long way from Canada. Contact me via the site and please put the word out to all the old Raggy Behind mob. We have arranged a Richard Hind reunion for 22nd June in Stockton. Brian Madigan, Liz Hill (Hindmarsh) and others will be there and we would love to catch up. “Smaffer Smith” now there”s a name from the past. Must be the same footballer from Brown”s Bridge. If you see this Smaffer get in touch and we”ll meet up for a beer and talk about those 17 a side games in Rudds Rec and over the Special School at Wrensfield Road. I”ve made a mistake Mr (Ginner)Ingrams was the General Science teacher not Mr. Heslop. A few more teachers to recall , Mr Fenny – Metalwork, Mrs Dale – Religious Knowledge & Mrs white – Maths. I attended Richard Hind (Raggy Behind! )until 1970″s. It”s amazing how well our “out of school” classes were orchestrated, although at the time I don”t think anyone thought it unusual – domestic science and needlework in Greens Lane; Music Lessons in a church a quarter of a mile outside the school gates; Tennis, Hockey & field events in Ropner Park and school dinners half a mile away in Nissan huts near Oxbridge Lane. All unsupervised! I think we must have either been brainwashed or had the fear of God put into us somehow as I can”t see today”s pupils behaving with the same decorum. Most of the teachers were genteel spinsters who also taught my mother (Shiela Watson) and great aunts. I wasn”t particularly fond of Miss Betts (Betsy) our maths teacher, who, during my time there devised numerous punishments for my “misdemeanours”. I recall on one occasion her making me polish a small battered cup which was situated on the bottom shelf of the Trophy cupboard below the cups and shields I”d won. Imagine my surprise when, on closer inspection,I saw my mother”s name etched onto it! Mary, you mention Mr Monahon who entered our school portals during our latter years at the school. On reflection I think he was dour because he was a little nervous of us – understandable really, we were a bit of a handful! My favourite teacher was Miss Cannon who taught Art. Miss Cowie our English Language teacher(I think Christine Shields gave her another pseudonym) used to petrify me with her “withering remarks”. Mrs Rawlings, PE, was lovely as were Miss Metcalfe, English Lit, and the (Miss) Stevens twins (the two stivvy”s), Botany & Domestic Science. It was a lovely little school though, such a shame it was demolished. Ive just been looking at all the comments relating to Richard Hind on this site and I am amazed at all the names that have cropped up, not only relating to Richard Hind, but to people I have worked with, danced with, played and watched football with as well as going to school with at both Junior and Senior parts of RH school. Its been wonderfull to virtually talk to people like Benny Brown and Harry Rhodes away in Austrailia Kevin Mac in USA and others from other parts of the country and the world. Bob Irwin – Cocoa Rowntree didn”t stay that long, he moved to a Middlesbrough school in 1956 I think. His son was at the school when I was there (1952-1957) although in a year or two below us. We were always encouraged to use a Rowntree”s cocoa tin for our vacuum experiments! A little bit of hidden history for you regarding Medals Ken Rhodes. The year Richard Hind won the Durham County Cup 1949/50 they played Newham Grange at the Newham Grange School, in the first round of the Durham County Cup. Newham Grange at the time were top of the Stockton Schools League. The game officially ended 0-0,Richard Hind won the replay at Grosvenor Road. Newham Grange had scored in the last minute through myself. but I was given offside, this puzzled me at the time as I had beaten two players before scoring. Twenty odd years later the referee of that match told my father who he occasionally had a pint with, that he had disallowed the goal because he thought Richard Hind had a better chance of winning the Durham County Cup than Newham Grange. History proved him right, as Newham Grange lost a number of players at the Christmas holidays, but this referee who some older readers may be able to identify from this little story had had a guilty conscience all those years and asked my father to explain to me what had happened all those years ago. Fact is some times stranger than fiction and I held no grudge against this referee, as I had always found him to be a first class Sports administer and a friend. SORRY TO HEAR OF YOUR ILLNESS IN THE EARLY DAYS BENNY IM SURE YOU AND EDDIE WOULD HAVE MADE A FORMIDABLE TEAM AT RICHARD HIND.I WATCHED YOU PLAY A NUMBER OF TIMES AND WAS IMPRESSED. The reason I did not attend Richard Hind School Ken was that at eleven years of age I could neither read nor write, as I have mentioned previously on this site, this was due to constant illness between the years 5 to 10, and missing most of my early school life. Starting a Secondary Modern School in the “C” class was not a good way to reaching any sort of educational standard. I was lucky enough to be able to reach the “A” class by the third year and eventually finish my secondary education at a good level. Night School followed to complete the job. I will always be indebted to the Stockton Billingham Collage, and Head Wrightsons for their support during this period. I ATTENDED RICHARD HIND AND WAS UNFORTUNATE OR NOT TO BE THE LAST SENIOR YEAR CLASS BEFORE IT WAS SHUT.I LIVED RIGHT OPPOSITE NEXT DOOR TO THE NEW CITY GUEST HOUSE. MR CASWELL WAS THE HEADMASTER AT THE TIME. WAS THEN TURNED INTO A TRAINING CENTRE AFTER NEARS OF DOING NOTHING. DONT KNOW WHATS HAPPENING WIV IT NOW AS PARENTS MOVED SO FREQUENT ROUND THAT AREA. Attended 1966-71, some of the teachers were Tommy Dunne——–Tech drawing George Kerr——–Geography (Bill)Benzies——History (Ben) Benzies——English Miss Hall———-French Mr Humble———-Art (Dizzy) Bowman—–Science (Snudge) Woodward–Maths (Sprig) Smith—–Games Mr Butcher——–Religious Knowledge Mr Hall———–Woodwork Games usually consisted of football, for which we had to travel by bus , to what is now Surbiton Road. Before we played, (we originally had to get changed in a cold damp building with no lights or heating), everyone had to run around the perimeter of the fields,just to get us warmed up. Steve Smith – uncompromising centre half if I’ve got the right guy? I didn’t mind the run around the outside of the pitches, it was the ’17 walls’ that still gives me nightmares, with the late Dabsy Westwood lapping me a couple of times! Hope you’re well. You are right, we did PE in the hall as well, I suppose it changed with what class you were in? Only went to school dinners if my Mom made me, otherwise used to also cycle to Fairfield. However , school dinners were quite lucrative sometimes, as my friend Sue and I used to sell our food to the lads on the table.My favourite teacher was Miss Betts, and I did go and see her at her house over the road from the school, she was lovely and made us very welcome. Only Male teachers I can recall are Mr Carr, Mr Monahon or suchlike – Scots with an awful temper. We are having a reunion of our years in Stockton on 22nd June. We had a great time at our last one a couple of years ago but there were no girls except Liz Hindmarsh (Hill) so would be great to see a few more girls this year. Contact me on gtthomspon@gmail.com (note the unusual spelling)for details. Seem to remember the Girls doing PE in the main hall – not that we were ever allowed in at the same time. But yes seem to recall the girls doing singing elsewhere. The other teacher I remembered was Tommy Dunne for Tech Drawing – never smiled much but one of my favourite teachers he was a very fair man. Never had the pleasure of school dinners! I used to cycle all the way home to Newham Grange Estate each lunchtime. One lingering memory is the old co-op shop opposite the school that sold broken biscuits to us after school. Still have my old school reports and they make horrific reading. Reports were not like today where F is a grade and not FAIL like for us. I remember well my last day at Richard Hind I left straight after my 16th birthday to start work, and never looked back or called back to see my beloved teachers once. However, they must have taught me something as I, like most at the school, turned out OK.
You were lucky Alan, we had to walk to the baths! Do you remember the “Wesleyan Chapel”, girls used to go there for singing as well as PE.Also a long walk to the dinner huts up by Oxford lane, we certainly did some walking! I remember Richard Hind very well from 1960 to 1965 though not as fondly as I would wish. Head Master John rosser, teachers there were Mr Benzies, Woodward, Richie, Gibson, Clayton, Smith, Heslop, Bone, Kear, Fenny, Turnbull, Bowman, plus Ms Hall (French Teacher) I think that was it. Remember the girls school being seperated by a wall which we would peer over at every opportunity – though at the age of 11 I never knew why – by 13 I had caught on! I also remember going by bus to the sports field at Fairfield once a week for football, winter included and almost freezing to death in the wooden changing rooms – no showers! Also the trips by bus as a first year to the swimming baths at Stockton (old ones) and St Peter”s Hall where my favourite “sport” was playing “pirates” – chasing each other across all the apparatus. Mr Smith the sports teachers favourite cry was “last three ready”. Last three to get dressed after sports got Crossleys (student) slipper size 12 as a reminder to be quicker next time. Character building stuff! I seem to remember that Taffy Florence went to Frederick Nattrass from Richard Hind and Coco Rowntree arrived from the Frederick Nattrass to Richard Hind at the same time. When I left Richard Hind in 1953 Coco Rowntree was the Physics Master. Taffy Florence and Cocoa Rowntree went to teach at Frederick Nattrass Secondary Modern. Taffy Florence being the headmaster 1951-55. It was so nice to see this pic. Though I was on the girls side it looks the same. I was at Richard Hind until 1970, and never used the front door! I remember Eddie Wilkinson as a fine footballer and he probably played in the same Stockton Boys as yourself Benny. I would love to see photos of the old Richard Hind School gates which were situated outside the front entrance to the school. Incidentally the pupils at Richard Hind were never allowed to use the front door which was for staff only. As a final acknowledgement of their achievement in surviving five years at Richard Hind the pupils were allowed the honour of using the front doors as they left the school for the very last time and started a new life in the adult world. I can remember my walking through the doors and those old gates as if it were yesterday. Being a Newham Grange lad Ged I suppose I should not be talking about Richard Hind School although we had many sterling battles on the Football, Cricket, and Athletics fields. But I thought you may be interested in the following. The old Iron Gates to Richard Hind School now reside in Australia adorning the entrance to a Richard Hind old boys proprty. His name is Ron Davies, he is about 75 years old and a self made millionaire. He was in the Merchant Navy for a number of years then went in to Business manufacturing Vacuume Pumps and now has world wide business interest in Australia and even on Teesside. Ron found the gates I believe in a Scrap Merchants on Teesside and bought and shipped them out to Australia. Ron is a cousin of Eddie Wilkinson who you would remember as a good footballer from Richard Hind School. Ron also has his own private plane which he pilots himself from a local airport. I should try to get a photo of the gates for all you old Richard Hind Pupils. This photo evokes fond memories of my five years at Richard Hind from 1949-1954. Although the photo was taken c1978 nothing seems to have changed since my days there apart from doors being fitted to the arched entrances to the corridor. I can remember that running in the corridor was punished with detention. Gordon Mann recalls the classroom uses and the teachers involved during his stint in the old school. My memories are as follows: Classroom 1, English Language & Literature with Gee Gee Scott and later Wally Thomson; Classroom 2, Maths with Mr. Goodier and latter Johnny Rosser (The Boss); Classroom 3, Religious Knowledge with Ken Sawyer; Classroom 4, History with Taffy Florence and later Smiler Gibson; Classroom 5, Art with Sid Buckle; Classroom 6, French with Mr. Macclehatton and later Bud Abott; Classroom 7, Geography with Pansy Butler and later George Kear. Gordon has provided a separate photo of the Woodwork workshop where “Woody Woodpecker” Turnbull was brave enough to allow us near dangerously sharp tools and the Chemistry Lab where “Daddy” Dee was equally brave in allowing us to handle acids etc. Both facilities were across the way from the classrooms shown in this photo. The school had two further classrooms namely the Technical Drawing room, which was the domain of “Eggy” Plummer and the Physics Laboratory where “Cocoa” Rowntree did his best to send us all to sleep. These two rooms were at the opposite end of the playground. The favourite room was definitely the Chemistry Lab where we overlooked the adjoining Girls School playground. Those Richard Hind Girls were worth looking at. Happy days. These are the seven classrooms in which we were taught at Richard Hind Senior Boys, they are as follows: Classroom 1, Maths- Mr (daddy) Dee; Classroom 2, not sure; Classroom 3, History- Mrs Kelly; Classroom 4, English-various; Classroom 5, Art- Mr (Sandy) Dobing; Classroom 6, French-Miss Fletcher; Classroom 7, Geography-Mr (Charlie) Charlton. I left the school in 1948.